Zeus has a home with Koti and his wife Charlotte. Koti and Charlotte are veterans to fostering and adopting from RMGDRI. The day that Koti met Zeus at a meet n greet event, he knew that he was meant to live the rest of his life with his family, and, once Charlotte was able to meet him, that sealed the deal. 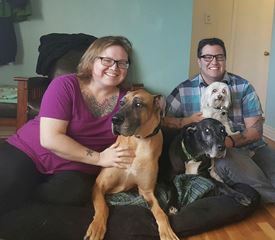 Zeus will have a full house of companionship to snuggle and play with, a Great Dane named Indy, a maltese named Oliver and 3 cats, Mouse, Puck and Freya! Way to go Zeus!! !